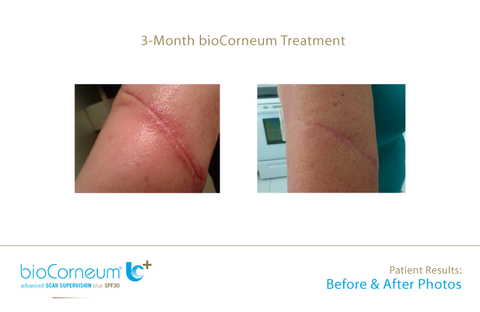 BioCorneum+ is an advanced silicone treatment with SPF30 for minimizing the appearance of scars while UV protection ingredients help guard them from any aggravating effects of the sun such as increased erythema (redness) and hyperpigmentation. Once applied, BioCorneum+ patented gel dries within minutes forming an invisible silicone sheet over the affected area. This protective barrier is breathable, flexable, and waterproof, BioCorneum+ binds with the stratum corneum (the outer layer of dead skin cells) to protect the underlying tissue against chemical, microbial and physical invasion of the scar. Why has my physician recommended I use BioCorneum+?